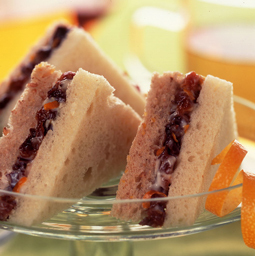 Dried Plum Tea Sandwiches - A recipe from Savor California, the online showcase for extraordinary gourmet foods and beverages from California. Photo courtesy of California Dried Plum Board. In small bowl, combine dried plums, yogurt, orange marmalade and orange peel; mix well. To make sandwiches, spread 2 tablespoons of dried plum-yogurt mixture evenly onto one side of each white bread slice. Top each with one slice of whole wheat bread. Using sharp knife, trim crust. Cut each sandwich diagonally into quarters. Servings: 12 servings of 2 sandwich quarters each.